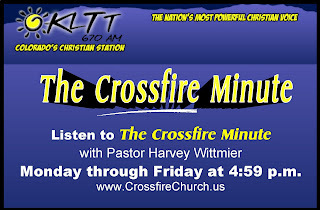 The Crossfire Minute: I Hope The Crossfire Minute Blesses You! According to Hebrews 11:1, faith is being sure of something we cannot see. It’s trusting God when there is little or no evidence. I started doing these 60 second messages a few months ago by faith, knowing that they were a God-idea, but not knowing where the money would come from or if anyone would listen to them. Now I'm encouraged more and more as not only is money there for the air time, but people are listening and being blessed by the truth of God going forward each day. God is greatly increasing my faith as I walk out each day in faith. I hope you’ve been blessed by these messages.